“I don’t know why I go to extremes.” (Billy Joel) Extreme volatility in the markets was the norm in recent days, due in part to fears of inflation and higher rates. Plus, home prices continue to rise across the country. Data analytics firm CoreLogic reported that home prices nationwide, including distressed sales, rose 6.6 percent from December 2016 to December 2017. Prices also increased 0.5 percent from November to December. CoreLogic noted that rising incomes and consumer confidence have increased the number of prospective buyers. This increase in potential buyers, coupled with limited inventories of homes for sale on the market, continues to drive prices higher across the country. 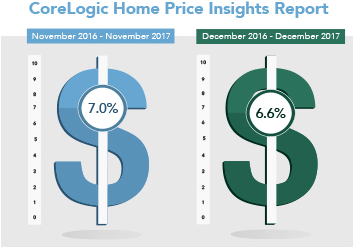 Looking ahead, CoreLogic forecasts that price gains may cool a bit, with a 4.3 percent gain expected from December 2017 to December 2018. Though there weren’t any inflation reports in the latest week, inflation played a part in the volatility the markets experienced. The January jobs report saw a higher-than-expected rise in wages, which came on the heels of the January FOMC meeting statement in which the Fed said that inflation could move higher in 2018. Inflation reduces the value of fixed investments like mortgage bonds, which means signs of inflation often hurt mortgage bonds and impact the home loan rates tied to them. Stocks also reacted negatively because inflation brings higher rates, and higher rates hurt corporate borrowing. Stocks even entered correction territory, as we saw a 10 percent decline from recent highs. At present, the annualized Core Personal Consumption Expenditures, the Fed’s favorite inflation gauge, is still at a low 1.5 percent, below the Fed’s target range of 2 percent. The Fed, and investors, will be watching the upcoming inflation reports closely to see if signs of an increase in inflation are present. The government briefly shut down at midnight on Friday but re-opened several hours later after the House approved a spending bill that will fund the government until March 23. Home loan rates rose in the latest week, reaching highs last seen in April 2014. However, rates still remain historically attractive. The second half of the week features key reports on inflation, housing and manufacturing. Look for news on inflation with the Consumer Price Index on Wednesday and the Producer Price Index on Thursday. The closely-watched Retail Sales report will also be delivered on Wednesday. Housing data will be released on Thursday with the NAHB Housing Market Index, followed by Housing Starts and Building Permits on Friday. Thursday also brings weekly Initial Jobless Claims and manufacturing news via the Philadelphia Fed Index and Empire State Index. The Consumer Sentiment Index will be released on Friday. If you or someone you know has questions about home loan rates and products, please contact me. I’m always happy to help.